TOKYO--(BUSINESS WIRE)--GVIDO MUSIC Co., Ltd., a group company of Warehouse TERRADA will exhibit its GVIDO device in the GVIDO MUSIC booth at The 2019 NAMM Show, the world’s largest music tradeshow to be held in Anaheim, California, US from January 24th (Thu.) to January 27th, 2019 (Sun.) (Booth No. 8735). The NAMM Show is the world’s largest music tradeshow, which each year attracts more than 100,000 people from more than 120 countries and regions around the world. GVIDO MUSIC will continue to increase its presence in the music industry throughout the world. - Venue: Anaheim Convention Center (Booth No. 8735), Anaheim, California, U.S.A.
GVIDO is a dual-screen music score device which has functional features such as its light weight and ease in viewing music scores. In addition to these features, the design has also been praised, and in April 2018 GVIDO received the Red Dot Design Award, a highly coveted German design recognized worldwide, and was selected as one of Japan's GOOD DESIGN AWARD BEST 100 in October 2018. 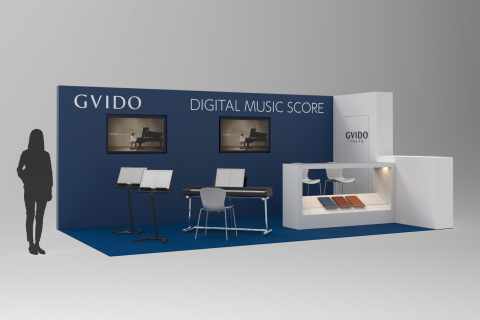 The GVIDO store distributes digital music scores and will cooperate with music score publishers to expand the provision of music scores for individual pieces of music. The global store is offering pieces published by five companies to Japan, North America and Europe, and the Japan store is offering scores from an additional nine companies.